Don't Settle For Less, Settle for Handtrucks2go's Top-Selling Builders Hoist Lifts! Builders hoist lifts are used to lift heavy and unwieldy materials. 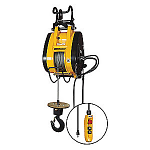 This types of hoist is specifically designed for material handling done in building sites, construction workplaces, warehousing, storage areas, factories in general, elevator liftwell maintenance and can also be utilized for a variety of domestic lifting applications. Aside from that, the users can benefit from the lack of manual effort needed to operate them saving you time, effort and most importantly safety for your people. Handtrucks2go’s builder hoists feature easy mounting, great performance and made with the highest quality components and engineering that is built to accommodate your material handling needs and desires all at an affordable price range. We are currently partnered with the award-winning OZ Lifting Products, one of the top and best-selling material handling manufacturers globally, here to give you the best of the best. You can be rest assured that it meets all quality control standards and is of the highest, most-durable quality. Handtrucks2go provides you not only complete service for the design, supply and installation of a range material hoists but also we offer ergonomic and innovative solutions to your material handling problems that are not solvable by ordinary equipment alone. That is why we are proud to bring you the best selection of builders hoist lifts here on our very own website! Call us today at (888) 811-5941 for assistance finding the right hoist lift or crane for your application.